NCDC National Coordinator/Chief Executive Officer Dr. Chikwe Ihekweazu listed the states as Bayelsa, Rivers, Ekiti, Akwa Ibom, Ogun and Cross River. He said all the suspected cases were receiving medical care and the patients improving clinically in their various states. Ihekweazu said the centre had activated an Emergency Operation Centre (EOC) to coordinate the outbreak investigation and response across the affected states. Measures have been put in place to ensure effective sample collection and testing to enable laboratory confirmation. Risk communication activities have been heightened to advise the public on preventive measures. All 36 states and the FCT have been notified for preparedness,” he explained. The Lagos State Government confirmed yesterday that it had recorded two suspected cases and appealed to residents to remain calm and vigilant. Commissioner for Health Dr. Jide Idris told reporters that the two suspected cases were being investigated. Idris said the two suspected cases were recorded in a private hospital which he did not name. He added that one of the suspected cases just came from Bayelsa State and ate bush meat. Idris said the two suspected cases had been quarantined in their various houses pending the result of the investigation. The commissioner said in the wake of this outbreak, the government was reiterating the need for members of the public to observe and maintain a high standard of personal and environmental hygiene at all times as part of the precautionary measures to prevent the spread of the disease to the State. He urged the public to be vigilant and report any suspected case of the disease to the nearest public health facility or the Directorate of Disease Control in the Ministry of Health. “Also, health workers are advised to practise universal safety precautions in the management of suspected or confirmed cases, wear appropriate Personal Protective Equipment when attending to cases, wash hands after each contact with patient or contaminated materials while surveillance system must be strengthened. Idris called on residents to remain calm and go about their businesses without fear as the government had put in place adequate measures to effectively prevent and control the spread of the infection to the state. 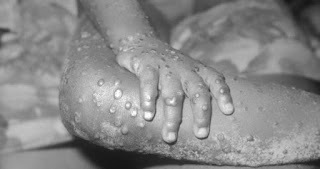 “In case of any suspected case of Monkey Pox, the Lagos State Ministry of Health should be notified through the following mobile lines: 08037170614, 09087106072,” the commissioner said. 1. Avoid contact with squirrels, rats and monkeys, especially animals that are sick or found dead. 2. Practice good hygiene, always wash hands with soap and water after contact with animals or when caring for sick human relatives or soiled beddings. 3. Avoid contact with respiratory droplet of an infected animals or humans, i.e holding animals close to the face. 4. Avoid contact with persons infected with the disease or suspected of the disease. 7. If you are a farmer, call in expert in suspected cases of animal illness and wear gloves when examining them.